LVM2 is backwards compatible with LVM1, with the exception of snapshot and cluster support. You can convert a volume group from LVM1 format to LVM2 format with the vgconvert command. For information on converting LVM metadata format, see the vgconvert(8) man page. The underlying physical storage unit of an LVM logical volume is a block device such as a partition or whole disk. This device is initialized as an LVM physical volume (PV). To create an LVM logical volume, the physical volumes are combined into a volume group (VG). This creates a pool of disk space out of which LVM logical volumes (LVs) can be allocated. This process is analogous to the way in which disks are divided into partitions. 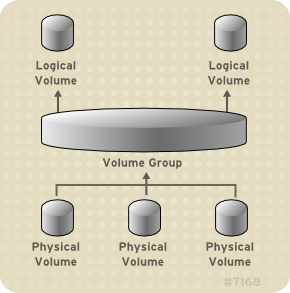 A logical volume is used by file systems and applications (such as databases). For detailed information on the components of an LVM logical volume, see Chapter 3, LVM Components.